Blood in the Water is a fascinating, sobering look at a horrific event. 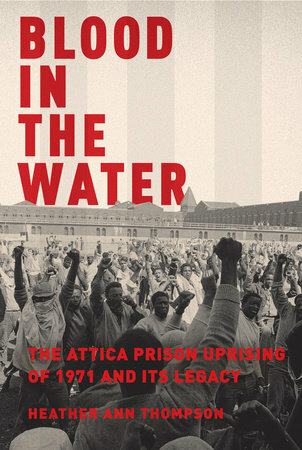 In early September 1971, some 1,300 inmates took over the Attica Correctional Facility in New York. A move designed to protest the years of mistreatment of prisoners within the penal system and in response to a number of previous, relatively non-violent prison uprisings, the events that unfolded over the next four days would have far reaching consequences that none involved could have foreseen. By the time the heavily armed troopers and correction officers finished their counterattack to take back the prison, 39 men were dead – both prisoners and hostages – while more than 100 others were severely wounded. It’s an event which, in hindsight, seems almost unfathomable, yet it was sadly very much in keeping with the times in terms of the overwhelming “us vs. them” mentality permeating the nation (just see the Kent State massacre for further proof of the heavy-handed tactics employed by those in positions of power). Heather Ann Thompson’s Pulitzer Prize-winning look at the Attica uprising and its aftereffects, Blood in the Water, is a sobering reminder of how quickly things can escalate from civil unrest to mass carnage. Following years of research and unprecedented access to all manner of files, artifacts and personal accounts of those who lived through the madness, Thompson has compiled what is to date the most complete look at the events that transpired at Attica. The level of government involvement in the cover up is staggering, her introduction laying out the lengths to which those in power have gone to ensure any evidence of wrongdoing remains obscured and lost to time. From heavily redacted documents to “missing” evidence that Thompson herself claims to have witnessed firsthand only to have it vanish shortly thereafter, it’s clear that the wounds inflicted by the uprising and armed suppression may never truly heal. Rather than simply recount facts or take a chronologically linear approach, Thompson peoples her narrative with the lives both lived and lost within the walls of the Attica Correctional Facility. Laying out the horrendous conditions in which the inmates were forced to exist and the government meddling that led to the explosion of frustration, she creates a fully-formed story that possesses a level of depth and nuance often lost in more academic accounts of historic events. This isn’t to say Thompson’s work is that of a layman, rather her approach is not only incredibly accessible, but also wildly engaging and with the breathless pacing of a socio-political thriller. That these tragic events actually transpired nearly 50 years ago is all the more haunting as we are drawn into the lives of the prisoners and correctional officers whose lives were forever changed. More than anything else, Thompson’s investigative persistence and tenacity should be applauded as, without it, much of the information contained within the 700-plus pages of Blood in the Water would’ve remained hidden from the public. Given the social and political climate within which we are currently mired, the lessons Blood in the Water affords are painfully relevant. From institutionalized racism to rampant political corruption, sadly little has changed in the intervening decades. That prison reform – not to mention overcrowding – remains an issue shows just how futile the efforts of those who ultimately gave their lives to help better their own living conditions really were. Blood in the Water is a fascinating, sobering look at a horrific event, the lives of those most directly affected, the level of political corruption involved and just how effective persistent legwork can be in uncovering long-hidden truths.